PTE writing? A battle you’re never going to win?! Don’t worry, you’re certainly not the only one. MostPTEstudents feel like they’re putting in precious time and effort, practising the essaysand summaries, taking the tests again and again, making some progress but never quite reaching that ultimate goal of actually passing the test! We can help you to finally get there be it 65, 79 or impeccable 90. 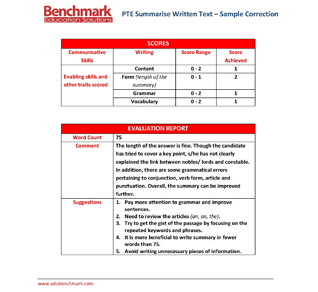 Here at Benchmark Education, our team of highly qualified and experienced teachers know the PTE writing test inside out. Trained in the intricacies of the PTE scoring system and with 1000s of essays under our belt, we know exactly what the assessors are looking for that can push you over the threshold to achieve that elusive 90 score. Equally, we can easily point out those mistakes that are made over and over that stop you from doing so. We can show you what NOT to do. 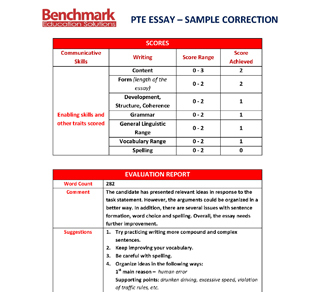 Our PTE Writing Correction service is formative and tailored to the individual requirements. We take the time and care, not only to correct your essay, but to provide specific, targeted advice, showing you the areas on which to focus your energy to improve your score. No more wasted hours revising the same material without results. With a bit of hard work and the support of a Benchmark evaluator, you CANand WILL get those results and start the new life you have been waiting for. So what are you waiting for? Why is Benchmark Education for you? One personal tutor is worth a hundred study guides. Why? A study guide gives you the general picture. It tells you all the areas that you need to be proficient in to pass a test. It’s a great place to start. However, once you’ve got to the point where you know all these basics, you need some more directedtraining to enhance your individual strengths and tackle your areas for development. Just as you wouldn’t go to school or university without a teacher, you’ll struggle to perfect your OET writing skills using books and websites as your only aid. Our dedicated team can provide that specialist human input that all learners need. Good Teacher + Hard Work = Success! Simple, but true! What does the Benchmark service provide? We know that passing the PTE test can feel like an uphill struggle. We make it our mission to help you along the way. Our service is interactive and flexible. We take on the role of the PTE assessment program but with the skills and guidance of a mentor. When you submit your essay or a summary to us, one of our native English-speaking team of teachers will begin by reading and proofreading your work, correcting the grammar, sentence structure and word choice so that the English used is accurate. 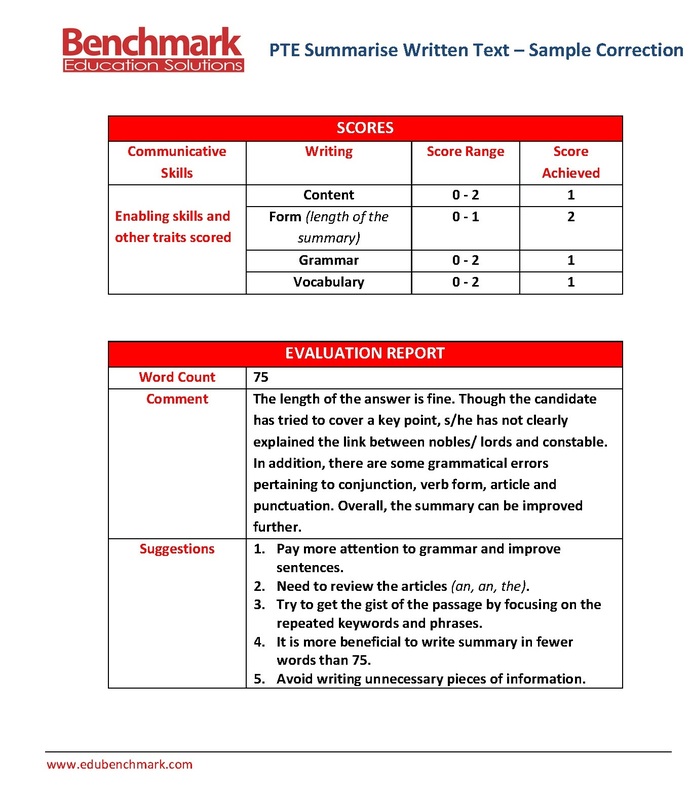 Next, they will turn their attention to the task requirements and the characteristics of the appropriate writing style and structureand provide the necessary guidance for your PTE writing correction. Finally, they will provide invaluable feedback about the areas for development where you will need to put in more work. You can then take your corrected essay away and transform it into the essay that you wanted to write! With our guidance, the next essay you submit will be a bit better, then a bit better still… until you reach the top of that mountain! What exactly do you receive after submitting a task? 1. 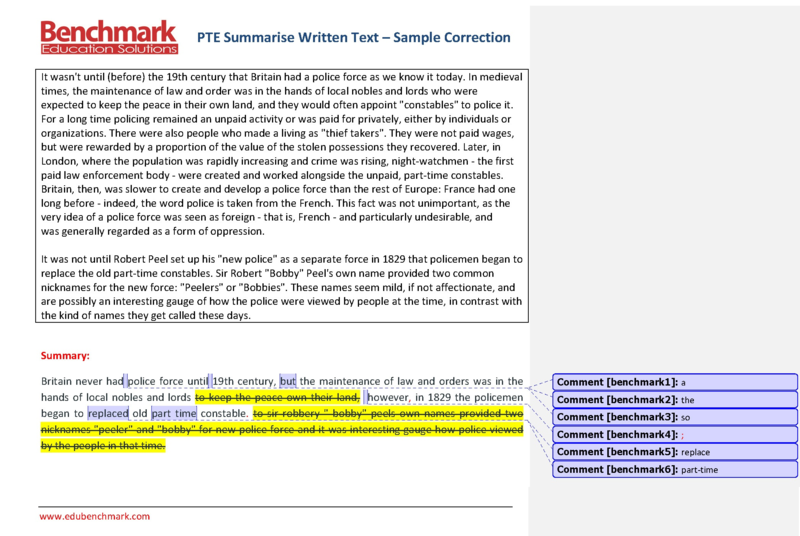 Detailed corrections of errors relating to grammar, spelling and content in comment balloons and highlighted throughout the text. 2. Developmental comments highlighting your strengths which can be used to help your further progression. 3. 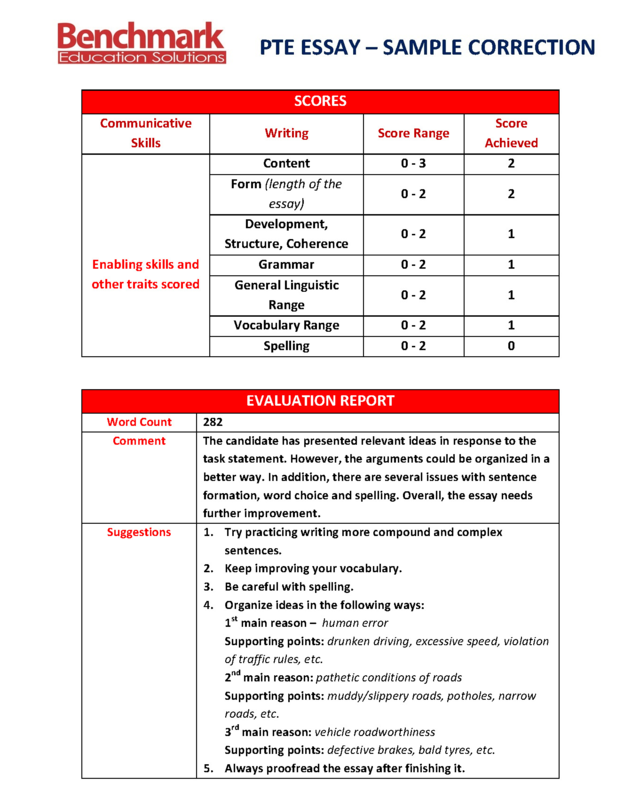 Identification of what is missing from/incorrect in your essays to reach the desired score and support on how to develop these areas of weakness that may be holding you back. 4. 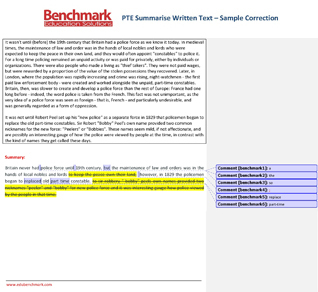 An estimated PTE writing test score and a comprehensive explanation of that score. How do you useour correction service? 5 Simple Steps to Success! *1 writing is either 1 essay or 1 summarise written text, not both. *Handwritten/Scanned letters may take additional 24 hours to return. *Tasks submitted on Saturday and Sunday may take a few additional hours to return. Your learning and your future career is in your hands but we could all do with a helping hand. That’s where Benchmark Education comes in! So, if you cannot pay using "Pay Now" button on the table, simply email us with at info@edubenchmark.com with your preferred payment option and we will provide all details to you. Will you give me writing topics and text to summarise? Absolutely! We will provide you with a list of well-researched essay topics and short paragraphs for summaries. What’s more, you have the option of using your own topics as well. Do you provide any offers? Is there a time limit on my package? We all have different needs and responsibilities in our lives and for this reason we like to giveyou the flexibility to study at your own pace. Your package lasts for a whole year after purchase, so you can study in a way that suits you. Should I submit the tasks in bulk one go or one at a time? Again, this is completely up to you! Some people like to submit one task at a time, giving them the chance to use the PTE correctionsgiven to inform their next task in order to progress. Others will submit a bulk ofseveral essays at once so that they have a substantial amount of material to work with in their next revision session. 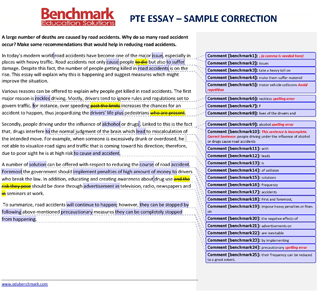 See what works best for you with your PTE essay writing. Are there any specific software or formatting requirements? It’s all very easy. Type your essays in a Microsoft Word document or a plain text file. E-mail your document to students.benchmark@gmail.com. Additionally, you can scan a handwritten PTE writing sampleessay or summary and send us the image. Remember, your PTE exam is computer based! You will receive a response within 1-3 days (1 day longer for the scanned essays). 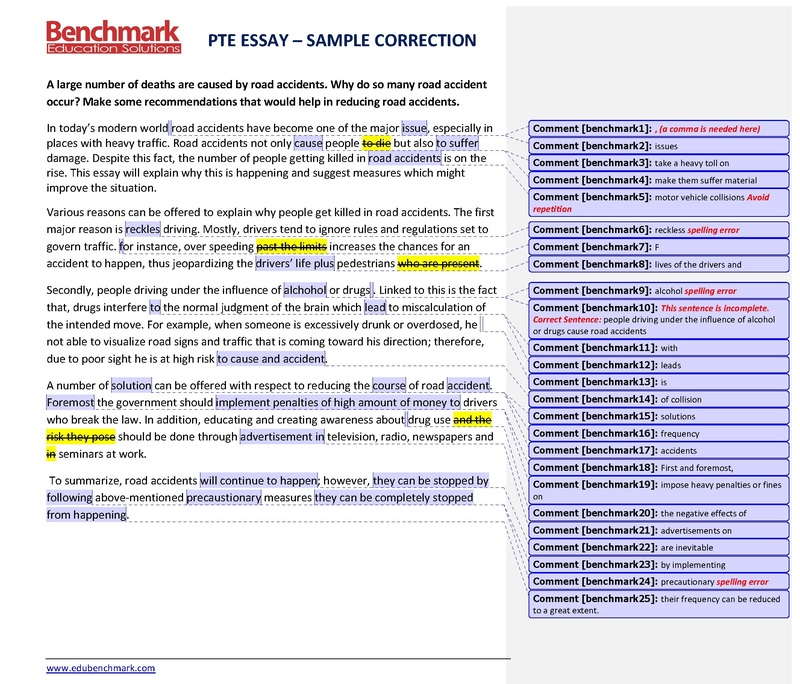 Does Benchmark Education provide correction services for any other exams? We certainly do! Our expert teachers and evaluators are trained in helping students to achieve success in a variety of exams such as GMST, GRE, IBT, TOEFL iBTand OET. If you’re interested in any of these services, please find the details on our website or feel free to send us an e-mail and we’ll give you all the information you need. Yes! Benchmark is for everyone; that’s our philosophy. We are about people, not statistics (although our stats our pretty good too!) All our clients have different skills, different needs and vast potential that is there to be unlocked. We strive to help each student grow, progress and flourish in their pursuit to ace the exam, their command of the English language and ultimately the start of an exciting future career path. Give Benchmark a try today and take the first steps towards winning the PTE battle once and for all! We are more than happy to answer any questions we have missed or provide further information about our services. Contact us at info@edubenchmark.com and one of our customer service team will get back to you promptly.